Rocky Mtn ENT Associates (Centennial) - Book Appointment Online! 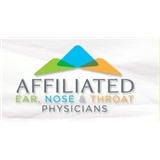 At Rocky Mountain ENT Associates in Greenwood Village, Colorado we aim to provide each member of your family with the best ear, nose and throat care possible. Through every stage of your life our team is here for you. With a strong focus on quality patient care, our team treats patients, both medically and surgically, for a wide variety of ear, nose and throat problems. It is our goal to offer health care services that will improve your quality of life and get you back to doing all of the things you love. Dr. Carter was great. Professional and personable. Did a great job on my ear surgery.